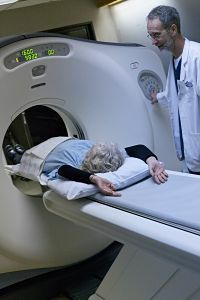 St. Luke's Hospital offers a variety of digital imaging modalities designed to meet the radiology needs of Polk County and surrounding communities. Our licensed, experienced technologists perform the exams while Board-Certified Radiologists interpret the findings. With digital technology and the PACS system, physicians can access their patient's images from any remote computer for enhanced views and quicker diagnosis. Bone Densitometry is a screening exam used in the diagnosis of Osteoporosis. Osteoporosis results in more than 1 million hip, spine, and wrist fractures annually. This disorder affects nearly one-half of all post menopausal women, the largest group at high risk for osteoporosis. St. Luke's GE Prodigy Advance Full Scan takes only minutes, lowering exposure to radiation. A digital report is quickly sent to the referring physician. Digital Mammography is only offered in Polk County by St. Luke's Hospital. We perform both screening and diagnostic exams as well as needle localizations and ultrasound-guided biopsies. Echocardiography services are offered in St. Luke's Hospital's Radiology Department. An echocardiogram, also called an echo, is an ultrasound of the heart. This important procedure uses sound waves to produce images of the heart. A computer records the images and can create a moving picture of your heart. From this test, your doctor evaluates the health of your heart and blood flow. Echocardiograms can help detect and determine treatment for heart disease, heart attacks and vascular disease that can lead to stroke. Unlike an x-ray, there is no radiation with this test. MRA (Magnetic Resonance Angiography) studies the carotid artery, blood vessels in the brain, soft tissue and the aorta. With CT, we can also direct procedures such as biopsies and drainages. General X-ray is used for routine studies, portable exams, and in the Operating Room. For more information, contact Teresa Davis, radiology supervisor, at (828) 894-3311 or email.